– without needing assistance from a main dealer! Simple to operate, the bespoke tool uses a push-button operation and supports vehicles from 2000 onwards. The EEC DPF Diagnostic Tool initially covers a substantial range of application numbers in the EEC range, and this will be quickly and greatly increased through updates that customers will be able to download from the EEC website. 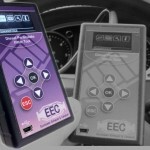 The EEC DPF Diagnostic Tool has been competitively priced to ensure that it is available for small factors and garages for a small initial outlay, and comes complete with a protective plastic case. For more information or to place an order for the EEC Diesel Particulate Filter Diagnostic Tool, call our sales team on +44(0)23 9224 5300, email sales@eurocats.co.uk or click here for our contacts directory. We provide free updates for the application database for one year, and afterwards charge an annual subscription fee of £75.00 for access to our ever-expanding database. For technical support with the EEC DPF Diagnostic Tool, please phone our dedicated support number for this product: 01225 702 104.